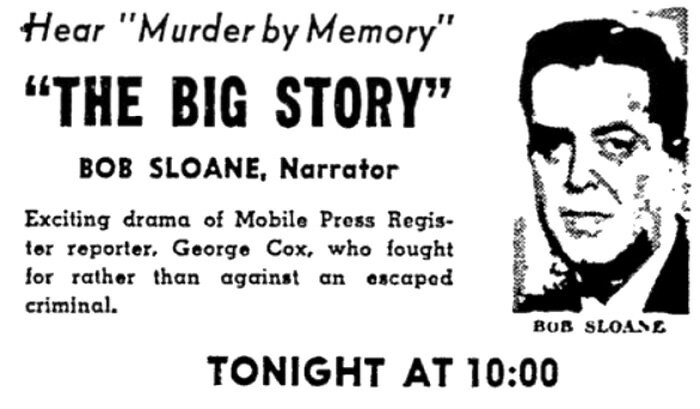 "Big Story - A Manhunt In Manhattan"
Based on real life news stories, Big Story featured murder and other violent crime cases from the point of view of a newspaper reporter. A unique and exciting format, Big Story dramatized a different news reporter and their heroic deed each week. According to the ads of the day, this program starred "a reporter who has solved a crime, exposed a corrupt political administration, smashed a racket, or performed some other notable public service. At the end of each program the real news reporter was brought on the air and given a $500 reward by the sponsor of the show, Pall Mall. For more newspaper-crime reporting, see also: Big Town, Big Story, Casey Crime Photographer, Europe Confidential, Front Page Farrell, Night Beat, and Shorty Bell Cub Reporter. Be the first to comment on "Big Story"